Williams Lake serves as the commercial hub for much of the Cariboo Chilcotin Region. Surrounded by rolling hills, expansive green forests and some of the best cross-country terrain British Columbia has to offer, the city serves as the jumping-off point for activities ranging from the gentle to the extreme. Kayaking, lake fishing, dogsledding, golfing and heli-skiing are a few of the recreational opportunities available near Williams Lake. Located northwest of Kamloops Williams Lake is linked to Kelowna, Penticton and the border of Washington State in the US by Highway 97. The city also is a receiving point for travelers heading west on Highway 20 to Tweedsmuir Provincial Park and the coastal city of Bella Coola. There are a wide range of attractions to see visit and around Williams Lake. A major ranching area, Williams Lake is considered BC's "Stampede Capital." The city hosts a rodeo each Canada Day weekend that includes competitors from all over North America. For those who enjoy early western history, the Museum of the Cariboo Chilcotin offers a fascinating glimpse into the life of some of BC's earliest pioneers. Visitors can view exhibits on BCs ranching history, or learn about the local First Nations peoples who have resided in the area for thousands of years. The Xats'ull Heritage Village, a traditional Shuswap First Nations village that has existed for more than 4,000 years is also located in Williams Lake and is open to tours. 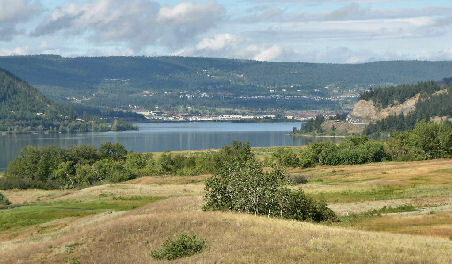 Williams Lake offers a wealth of dining and shopping amenities to the visitor. There's nothing like a good beef dinner when visiting ranching country, but fast food and ethnic dishes are easy to find as well. We appreciate your orders. They help keep Go Northwest! online.